Saturday’s main event in Las Vegas produced an unexpected result as Marquez was heavily favored to win the fight against Bradley, but the American champ was the more aggressive fighter that night, particularly at the second half of the bout. However, Marquez felt he won the match. “I came to win. The judges took it away. You don’t have to knock out a guy to win.” It seems he felt the outcome was unbelievable and it was very hard for him to accept his loss. Meanwhile, reports said Bradley won 116-112 and 115-113 on two cards while one judge gave Marquez 115-113. According to an ESPN Boxing article, Ringside stats showed Bradley connecting on 168 of 562 punches against the 40-year-old Mexican fighter’s 153 of 455. 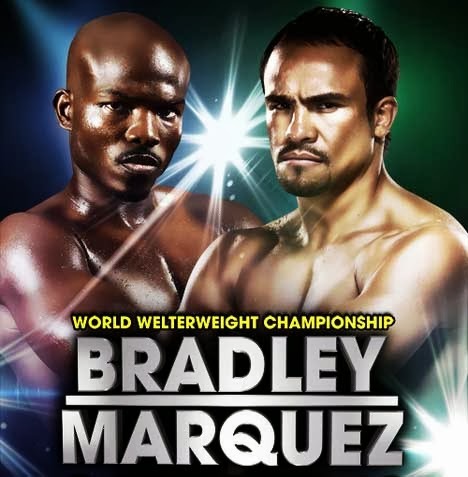 A video replay of Bradley vs Marquez will be embedded on this page upon availability online. Update: Here’s one YouTube video that’s up so far.